Can’t attend on 28th as it clashes with Ask Parents First. But there will be plenty to be done between then and October if this is to mobilise national ill-feeling against what Lansley and his ilk have done, are continuing to do. 7 October is in my diary. 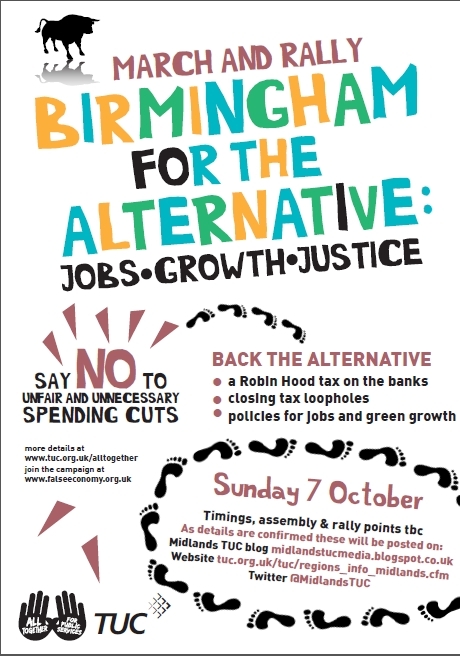 The Tories are back in Birmingham for their 2012 conference, and the Midlands TUC have announced they will be holding a demonstration on Sunday 7th October. Today we are calling for grassroots organisations in and around Birmingham to come together and discuss what we can do over the next 5 months to get as many people from the West Midlands as possible to the demonstration, and what we can do to help pressure the TUC to make this a national demonstration against austerity. Monday 28th May, 6pm-7pm at Unison Offices, 19th Floor McClaren Tower, Priory Queensway, B4 7NN. Unemployment is rising, prices are going up, wages staying down and benefits being slashed. We’re back in recession, performing worse than the Eurozone. The rich are getting richer and benefiting from tax cuts whilst working families see VAT and fuel prices jumping ever upwards.